Do Enzymes For Yeast Infection and Candida Really Work? Enzymes for yeast eat the cell wall of candida and other yeasts because the cell wall is composed of fiber and glycoproteins. Many times the patient will not experience any die-off reaction at all, especially when using an enzyme that contains protease, which is a huge bonus. 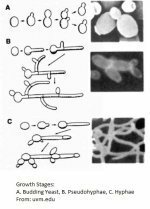 Lets review the basic cell and biofilm structure of yeasts. 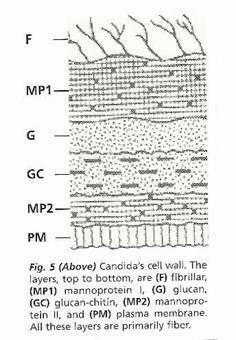 Candida yeast has a cell wall composed of mannoprotein-1, glucan, chitin-glucan, mannoprotein-2 and plasma membrane. A mannoprotein is a complex carbohydrate-modified protein used by yeasts to anchor the proteins to the cell wall glucans. Glucans are a polysaccharide fiber, that are found in the cell walls of bacteria, fungi, algae, lichens and plants such as oats and barley. Chitins are long-chain polymer of N-acetylglucosamine, which is a derivative of glucose. It is a primary component of fungal cell walls and the exoskeletons of arthropods. It is very similar to the polysaccharide cellulose - the basic fiber component of plant cell walls. The plasma membrane is a fatty lipid and protein layer and the nucleus of the yeast cell is also made of protein. The fatty acids oleic, linolic, palitic, and palmitolic are found throughout its structure. Knowing that the cell wall of candida yeast is made up of proteins with carbohydrate rich fibers including a protein and lipid nucleus, a properly designed enzyme formula should contain the necessary enzymes to digest all of these parts. Biofilms are used by pathogenic yeasts, bacteria and viruses as a way to hide from the hosts immune system. At the same time the pathogen will release spores or cells in an attempt to spread throughout the body. Upon release of the spores the immune system mounts a defense, which causes inflammation and can make you feel sick. Yeast biofilms generally contain parts of the cell wall structure itself. It will be composed of cellulose, which is basically a chain of polysaccharide fibers. The biofilm will also contain polynucleotides that are made from bonded sugars and are primarily its dna and rna material. Also present are polypeptide proteins and carbohydrate glucan polysaccharides. The biofilm also contains fibrinogen and fibronectin or scar tissue, which are the same materials that the body uses to clot the blood and repair wound sites. All of these materials are bound together by lignands with stickiness properties much like lectins in wheat. The biofilm will form in the section of the picture above marked F. The biofilm is the first thing you need to get through in order to have any effect on the yeast cell itself. So, the biofilm is made from proteins, with carbohydrate rich fibers much like the cell wall. In addition, it contains fibrinogen, fibronectin and lignands that bind the biofilm together. More on the cell structure and biofilms here. For the mannoproteins in the cell, polypeptide proteins in the biofilm, and the nucleus of the yeast cell you need a protease enzyme. The glucans and cellulose-chitin found in both the cell wall and biofilm you need cellulase and hemicellulase. Beta-glucanase is also helpful but cellulase always has beta-glucanase side activity so you're covered in that respect. The polysaccharides found in both the cell and biofilm can be removed with amylase, invertase and glucoamylase. The fibrinogen, fibronection and the lignands in the biofilm can be removed with serrapeptase(serratiopeptidase). For the lipids a lipase enzyme would work. Note: Most enzyme formulas won't contain this enzyme because the lipids are less than 10% of the cell structure. In our opinion, getting through the biofilm is the most important aspect when treating yourself for candida yeast infections. If you don't get through the biofilm, you are not going to have any long term success getting the yeast under control. Do Enzymes for Yeast Really Work on the Cell Wall? Way back in 1968 Roberte Domanski and Ruth Miller from the Dept. of Microbiology at the Women's Medical College of Pennsylvania, used a chitanase complex and beta-glucanase on the cell walls of candida albicans. Within 5 minutes of exposure to the enzymes in the presence of water, the cell walls burst. Note the intact cells in picture 1 and the disrupted cell in picture 2. Because candida yeast is also a fungi with similar cell structure, there is no reason to not believe that these enzymes would not work on hyphael producing strains of Candida. What have we learned from these studies? In every study the enzymes did have an effect on the cell wall. Using multiple enzymes had the greatest effects. Beta-glucanase seems to be the best enzyme but alone is not the answer either. It should be noted, according to our lab testing, cellulase has beta-glucanase activity so all yeast eating enzymes do have this enzyme in it whether listed on the label or not. Just so you know, Chitinase is nothing more than hemicellulase. We have verified this in our lab as well. Protease does indeed work on the mannoproteins found in the cell walls of yeasts. Its effects can be further enhanced by the addition of cellulases and lipase. The obvious conclusion, based on the uses of these enzymes singularly and when combined, is to use an enzyme formula that has all the necessary enzymes required to digest every component of the cell wall. The studies suggest that complete formulas are going to have the greatest effects. Do Enzymes for Yeast Really Work on the Biofilm? Yes they do and they work extremely well. They also work for bacterial biofilms as we're going to prove to you. This is very important because half of the stool tests we see show no yeast but over growths of pathogenic bacteria. A published study in 2006 that was done at the Institute of Biomedical and Life Sciences in Glasgow, Uk; used multiple enzymes to see what effects they had on the biofilms of both candida albicans and candida tropicalis. Enzyme Effects on Bacterial Biofilms? This study done by Loiselle M, Anderson KW at the Department of Chemical and Materials Engineering, University of Kentucky, on the biofilm of the pathogenic bacteria Pseudomonas aeruginosa using the cellulase enzyme, showed a marked reduction in the film. The authors noted that using additional enzymes with the cellulase would probably increase the effectiveness, which is what we have suggested all along. In 2011, the Max Bergmann Center of Biomaterials in Dresden Germany did a study on the biofilms of Pseudomonas aeruginosa and Staphylococcus epidermidis. They used glycoside hydrolase's, which include the enzymes cellulase, hemicellulase, and amylase. They also used subtilisin A, which is a protease enzyme derived from the bacteria bacillus subtilis. Do the Enzymes Work on the Fibrinogen and Fibronectin in the Yeast Biofilm? This is where serrapeptase comes in, it literally eats these substances which are basically scar tissue. Because this enzyme digests non-living tissue and leaves live tissue alone; it has been found to be effective in removing the deposits of fatty substances, cholesterol, cellular waste products, calcium and fibrin on the inside of the arteries. The fibrinolytic clot removing activity of serratiopeptidase may also be able to help with thickened blood, increased risk of stroke, and phlebitis/thrombophlebitis. It's been reported to have an effect on sinusitis and bronchitis, atherosclerosis, carpal tunnel syndrome, rheumatoid arthritis and other autoimmune diseases. It is also highly anti-inflammatory and has been used in Japan since 1957 for many inflammatory conditions. And of course, it has been shown to help strip biofilms. I could go on and on here folks but I think at this point, you get it. Especially when you consider these enzymes have been studied repeatedly, and have been found to be effective, since 1968. What have we learned from these biofilm studies? No single enzyme works on the biofilms of every species of candida or bacteria. Using multiple enzymes at once enhances the biofilm removing effects. Once the biofilm is lessened or removed, medications are much more effective. If you were taking prescription drugs such as Fluconazole, these enzymes would enhance its effects. If medications are more effective after biofilm removal, the appropriate herbs or probiotics would be as well. After the biofilm has been reduced or removed, the enzymes don't always kill the yeast and definitely not bacteria. That means the best thing to do is to take things that will with these enzymes. If you have any questions about these enzymes for yeast infection please feel free to contact us from the contact page of this website. 3. Reduction of amphotericin resistance in stationary phase cultures of Candida albicans by treatment with enzymes. J Gen Microbiol. 1980 Apr;117(2):383-91. 1. Immobilized enzymes affect biofilm formation. Biotechnol Lett. 2011 Sep;33(9):1897-904. doi: 10.1007/s10529-011-0643-3. Epub 2011 May 27. 2. Cellulase inhibits Burkholderia cepacia biofilms on diverse prosthetic materials. Pol J Microbiol. 2013;62(3):327-30. 4. Targeting microbial biofilms using Ficin, a nonspecific plant protease. Sci Rep. 2017 Apr 7;7:46068. doi: 10.1038/srep46068.